I will continue writing about the end of the story of PCA later. It has been too much around here. William has been sick and we had to take him to the emergency hospital and stayed there for 9 hours. He had a stomach flu that got him totally dried out, so he needed fluid. I’ve got his flu with fever and stomach pain. In the middle of everything Kira started to have her puppies. She is the greatest mum on earth. She takes care of it herself we just watch and see that all looks great. And it did. 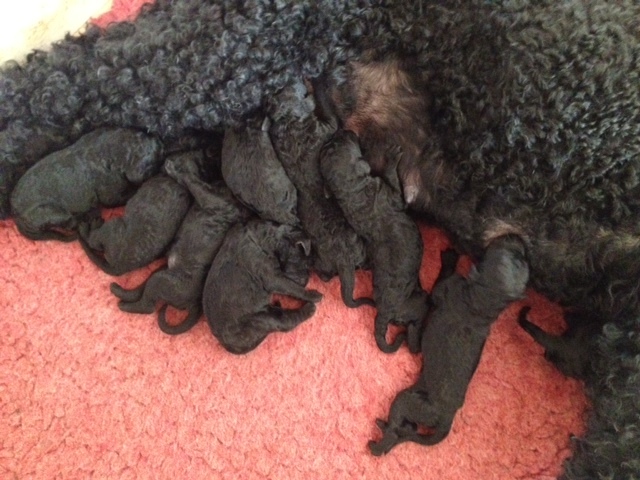 She takes a lot of time 15 hours to get 10 puppies, and they are all very strong and lively. Almost the same sizes between 300 and 400 gram each! 4 males and 6 females. Quite big for being so many, and she is still not skinny! She eats like a horse even in the middle of it all. The father to the puppies are Simon and I am looking forward follow this litter. Kira is a top producer and her puppies has great scoring on the hips. She is very black and always eats, the greatest temperament and all her other litters have straight great tails. That is why I want to keep something and move from that. At the moment I have no puppies left for sale in this litter but things can change. Off to do some work after being lame for a couple of days. ← Nothing happens unless first a dream!